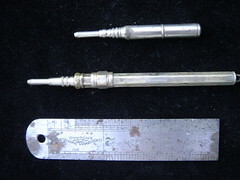 Two very small metal propelling pencils a three inch metal ruler. 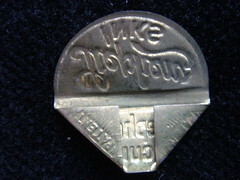 Made of very thin brass sheet. 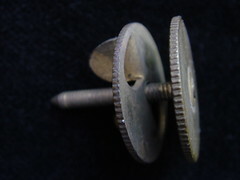 The front of the brass corner strengthener...I am guessing thats what these are...if anyone knows what they are please let me know. Another find from the pen nib box. 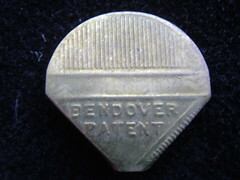 A very thin brass sheet corner strengthener. This was in the box of pens, I believe it is for hanging curtains. If anyone knows better please let me know. 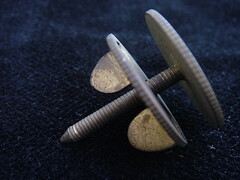 Another view of the mystery object. This is one of the items from Rick Cox's redistribution project. Rick left a box of items on or front room settee, just before he drove off. were two boxes of assorted metal objects which I will add to my collection. 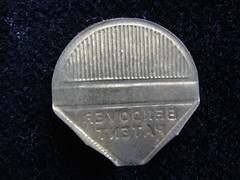 This first one is a mystery, I have no idea what it was used. A few tiny bits found in the tin. 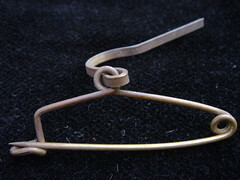 A strange safety pin with hook. 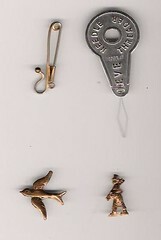 Two thin metal trinkets..a bird and what I believe to be a chimney sweep..they both have fold over tabs at the back...maybe some sort of good luck charms? 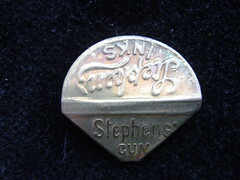 Nickel plated with a guarded coil. The child looks very embarrassed..wonder why?